Why one of the best methods for rental property seekers to use when looking for their best matched apartment or rental property is an apartment finder or apartment locater service, such as BrokenLease.com. We are known as an industry’s leader serving major metropolitan areas across the nation. Our team of experts include expert apartment finders, apartment locators and residential and apartment rental professionals. Each expert is proficient and qualified to help every person looking to rent a place to live regardless of what is showing up on their credit report or rental history. Our service is completely free to you! BrokenLease.com is designed to assist renters with finding a place to rent; whether it is an apartment, town home, condominium or other type of rental property. It is common knowledge that when renting an apartment or a rental property, the landlord or rental management company will look at the potential renter’s credit score, credit report and rental history before approving the leasing application. It can end up being unfortunate for many renters because of bad credit or unsatisfactory rental history showing up and ultimately affecting an approval for a place to rent. Problems on credit reports include delinquency or late payments, liens or judgements, broken leases, foreclosure and evictions. Do not let that stop you from finding the place of your dreams to rent. BrokenLease.com is able to successfully help renters acquire a place to rent regardless of what is showing on their credit report or rental history. Looking for an apartment throughout the United States in the major metropolitan areas can be stressful, BUT it really doesn’t need to be. We make the search for an apartment to rent very straightforward without the stress. In most major metropolitan areas, we can help you find a place to live. For well over twenty years, BrokenLease.com has assisted thousands of individuals find and get approved for rental apartments or properties who have issues with no credit history, bad credit, a broken lease, foreclosures or eviction. We work with a network of apartment managers and apartment complexes throughout the major metropolitan areas in the United States, which in turn will help you. We will end up saving you lots of time and money with our free proven service. Database for places available to rent is updated every hour. We know the absolute best place to rent in all of the major metropolitan areas. We know the management team at each of the apartment complexes. We know which apartments and rental properties are offering the most affordable utility rates. We know which apartment complexes charge the lowest security deposits. We know which places to rent offers the best leasing terms. We are able to search for the best locations and areas convenient for your needs. We know which complexes offer move-in specials and unadvertised special deals. We can find you the best places to live with the best schools. We can search the best places offering the accommodations you want like, pet-friendly apartments, garages, biking trails, pools, workout facilities, computer centers and more. Now, you can see why it makes sense having BrokenLease.com assist you! It might have been an ex who moved out and you could not afford the rent alone, or you became sick or ill and could not work. Layoffs happen also, and unexpected changes in your income level may have led to unpaid rent. If you have bad credit or have a broken lease, we can work with you to identify options for solutions. A broken lease can also happen when you have a sudden change in your life. You may have gone to stay with an ill relative in another town and could not manage your old lease and your new living situation at the same time. Many times an eviction reflects a long string of bad luck. The good news is that we have put together a detailed map of landlords who will accept broken lease history given other factors are now in place. GET ACCEPTED FOR AN APARTMENT EVEN IF YOU HAVE NO CREDIT, BAD CREDIT, A BROCKEN LEASE OR AN EVICTION WITH BROKENLEASE.COM. An apartment locating service such as BrokenLease.com can make finding and renting the most ideal apartment matching your needs much easier. You can pick the amenities and accommodations you require in your apartment, the area you would like to live, the price range, and then we will take it from there. Whether you would like a luxury one or two-bedroom apartment community or a low-income efficiency apartment, having Broken Leases assist you is the most ideal way to locate the perfect new rental place for your specific requirements. Also, we have the very best track record of working with individuals who have difficulty finding apartments due to bad credit, no credit, bankruptcies, broken leases, evictions, foreclosures, liens and judgements. Even if you were in a broken lease apartment, or had a broken lease home, you might have been a good tenant in other ways. It is possible you did a great job looking after the place, or perhaps you were very quiet, or became a contribution to your neighborhood. If you can take time to ask your colleagues for letters of recommendation, despite having bad credit, this can be of service as you go on your search for apartments near you that accept evictions. A good letter of recommendation can turn the tide in your search for a new apartment, and some are no credit check apartments, so with a good letter of recommendation and proof of income, you are going to have a better experience than if you do not have this combination of things helping you get into your new apartment. Because we are part of a national network of apartment finders for people with bad credit or broken leases in their past, we have taken the time to identify apartments near you that might not even check for credit. It’s going to be easier for you to find a place if you sign up with us, and let us do the homework for you. Fill out the request form and fill it out completely, then submit it. One of our professional rental experts will be back in touch with you and provide a list of the best matched apartments or other rental property. Working with BrokenLease.com, your apartment search will be stress-free! ASSIGN – You will be assigned your own personal agent who will take the information you provided to locate the absolute best apartments available for rent fitting your requirements and budget. RECEIVE – Once your information is inputted into our database, you’ll get a customized list of apartments to rent, which will include any pictures, available floor plans and rental prices. REVIEW – Your locator will take the time and go over the final results with you, and then we will go from there. Our rental professionals at BrokenLease.com will be able to find the absolute best apartment or rental apartment no matter what your credit score, credit report or rental history is showing. The entire process of finding an apartment and going through the approval process can be frustrating, especially if you end up getting declined because of bad credit or rental history. We have been working with countless people over the last two decades who have similar situations, so you are not alone. 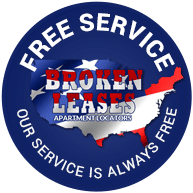 Broken Lease’s apartment service is absolutely free, and there is never any cost to you for our service. We will save you time and stress, so you can be more at ease and worry about packing your belongings for your upcoming move to your new rental place. It won’t take you long to realize that BrokenLease.com will be your #1 source to landing an apartment to rent. What are you waiting for? Let us help you find your next apartment to rent!